Merengue! Rumba! Bachata! 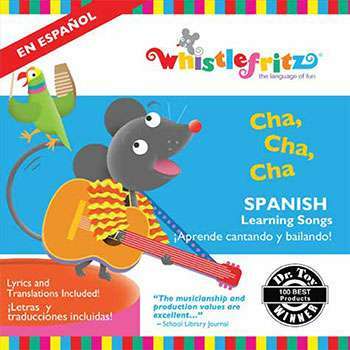 Get ready to cantar (sing), bailar (dance), and aprender (learn) Spanish with Cha, cha, cha, a colorful collection of Spanish songs for children. 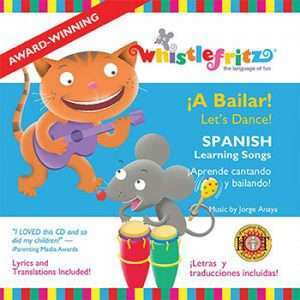 Performed by award-winning singer and songwriter Jorge Anaya, this CD is a delightful mix of lively Latin rhythms that children will love – and parents will too! Samba to Las Vocales (The Vowels), cha cha to Los Números (The Numbers), and polka to Que Llueva (Let it Rain). Cha, cha, cha makes learning Spanish exhilirating, educational, and fun! 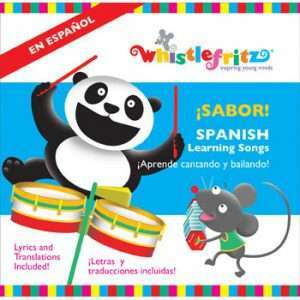 Celebrate the vibrant sounds of Spanish, at home and in the classroom! A collection of catchy, upbeat originals – plus well-known, popular favorites such as La Cucaracha, El Barco Chiquito, Los Elefantes, and Bingo – Cha, cha, cha is a fun, festive introduction to Spanish vocabulary. Dance, sing, and enjoy learning the letters of the alphabet, numbers, parts of the body, articles of clothing and more. A Translation Guide is included, providing an easy reference for parents and teachers who are first-time learners of Spanish. Winner of a Mr. Dad.com Seal of Approval; named one of the Best 10 Audio-Visual Products of 2010 and one of the Best 100 Children's Products of 2010 by Dr. Toy; named one of the 50 Best Products of 2010 by The Toyman Online; winner of an iParenting Media 2010 Greatest Products award; recommended by the Parents' Choice Foundation.